With the technology described on this page Hubbard effectively instituted targeted suppression of thought about other people, especially when it comes to himself and other Scientology authorities. Influenced by Hubbard’s false ideas about critical thoughts, Scientologists actually suppress the development of thought in each other and so inevitably inhibit each others’ ability to perceive, to reason, and to develop real understanding especially when it comes to Scientology itself. Actual perception and understanding is substituted with conditioned thought patterns in alignment with Scientology doctrines formulated by Hubbard, especially those starting with 1959 forward. The subject of Overt-Motivator Sequence and Withholds covers a false or misleading notion that individual’s “bad thoughts” or criticism is caused by one’s own bad deeds (referred to as “overts”) toward the target of criticism – this can be self, another person, some group, an object, a place or anything else that one may have bad thoughts about or criticize, especially(!) when it comes to Scientology or anyone involved in it including its management and Hubbard himself. Indoctrinated into this false belief, Scientology practitioners then seek to monitor and “handle” each others’ “bad thoughts” through coercive Scientology “confessionals” where an e-meter is used as a lie detector to drill into an individual’s past in search of any deeds that may be construed as bad deeds (overt acts) which in itself is subject to arbitrary evaluations through general norms in society as well as Scientology’s own criteria. This is probably by far the most destructive aspect of Scientology that robs its practitioners of the ability to OBSERVE and EVALUATE (especially when it comes to anything related to Scientology including the actions of its authorities) since suppressing someone’s “bad thoughts” inevitably leads to suppression of PERCEPTION of the realities to which those thoughts were applied as well as a deliberate destruction of ANALYTICAL ABILITIES in the target area of address which most often happens to be Scientology itself. Subject’s thinking processes are literally “rewired” to introvert on some wrongs within oneself when an individual happens to think or observe some wrongs with respect to Scientology. All of this however does not mean that Scientology practitioners lose an ability to express criticism all together. It just falls outside of one’s own volition (or self-determinism) and becomes a subject of “conditioned response” within the group dynamic as influenced by its authorities on one side – as in declaring people good or bad – and Hubbard’s evaluation criteria such as those for social and anti-social (suppressive) personalities on another. Perhaps some Scientologists get to a level where they do not evaluate at all but simply execute what is required of them as long as it is packaged within an acceptable framework of “for the good of humanity” or for the good of one’s own spiritual progress. This could probably hold more true for members of the Sea Organization who are under continuous control by the group and its authorities but can also hold true for public Scientologists who readily surrender their life savings into various donation schemes, their children into the Sea Org, and more of their money and time into various Scientology services including the confessionals themselves. 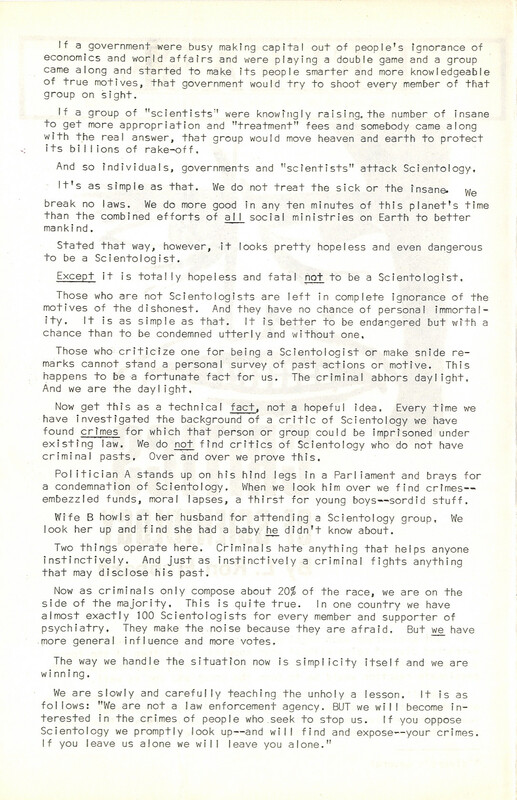 In some form, since the time these new processes were introduced in late 1959, Scientology practice inevitably becomes a struggle between one’s mind trying to restore its proper function as an intelligence apparatus designed to record perceptions and make evaluations in order to guide an organism toward optimum survival – a central tenet in Dianetics (even though if not stated so directly) – and Scientology’s own highly destructive forms of processing that seek to suppress and control the mind’s function to the detriment of the individual. This in turn keeps Scientology practitioners in a perpetual condition and a sense that there is something wrong with their minds which can draw them deeper into Scientology nightmare that advertises itself as a solution to the very condition that it perpetually creates through the theory and methodology described in detail on this page. The subject of Overt-Motivator Sequence and Overts and Witholds is covered in numerous places all throughout Scientology materials especially starting with late 1959 through the early 1960’s and is a part of Scientology’s “ethics technology” still in use in present time. Most of that data comes directly from a number of HCO Bulletins. [20 FEBRUARY 1962] Saint Hill Special Briefing Course: What is a Withhold? What is a withhold? A withhold is something that a person believes that if – if it is revealed, it will endanger their self-preservation. In other words, a withhold is something that endangers the self-preservation of the pc. Now, that is a very important definition. It’s taken me a very long time to get that definition. Now, if a pc isn’t giving me withholds, I’m afraid that I would become persuasive. A withhold is something that, if revealed, would be prejudicial to his survival. Now, there’s a rule. There’s a rule about this, about asking What questions. And this isn’t really about What questions but I’ll just show you what this is. My What question, I’m afraid, at the moment is “What have you done to your mother?” I would not even monkey with this motivator, see? I wouldn’t fool with it at all. The next gradient up – that would be – that’d be the most certain ground to mine. Motivator, motivator, motivator – man, that just takes the What question and practically writes it in legible script in front of your face, you see? Your next one up the line from that is the person is critical. The person is being critical of somebody. Well, the criticalness – you can go on and pull criticism forever without getting anyplace. You want to know what he did, did, did, did, did, done, done, done, done, action, action, action. There must be action back of that criticism. Otherwise, we wouldn’t have it, see? So, criticism is a sure indicator of an overt. Now let’s take the milder form of it which is explaining why it happened. The pc starts explaining – I don’t let the pc explain very long without giving him a new 1 sub-something or other on the What question. I give him a new What question to clean up. I’m liable to cut him off at that moment, on whatever we were talking about, and ask a little more pinched-in-close What. “What were you doing?” you know? Something like this. And he says, “Well, oh-oh. Oh, that!” And it alerts him. It’s just a lead-pipe cinch. “What have you done to your mother?” I mean, it just might as well appear – be printed on the auditor form, you know? I mean, it’d be that inevitable. Your next one is criticism, criticism, criticism. Well, there’s a real overt back of this, and so forth. It is not hard to see how this logic and processing methodology would serve to inhibit an individual’s ability to freely OBSERVE, EVALUATE, and reach CONCLUSIONS as well as to openly COMMUNICATE on those conclusions and evaluations especially with regard to other people and their actions, as well as those of one’s own. An individual is then forced to accept an auditor’s (now in role of a handler) labels and formulations per Hubbard’s instructions – i.e. evaluating PC’s communication as motivating, justifying, explaining, or criticizing to supposedly cover up one’s “overts” as opposed to making one’s own evaluations and conclusions based on recorded observations (which was an accepted formulation in 1950’s Dianetics). This is a form of psychological conditioning to suppress individual’s analytical abilities and produce a compliant subject as well as a form of interrogation to gather up potentially self-incriminating information. Now, if you look at this as a scale, you will find out that the withhold is measured by the degree of danger – the only reason I’m giving you this scale; I’m not talking about how you ask What questions – the degree of danger the pc conceives to be present on the subject of getting off the withhold. All right. If the pc doesn’t think it’s very dangerous, they give it to you directly and straight. If the pc thinks it’s a little bit dangerous, they explain around the fringes of where it might lie. If the pc thinks it’s rather confoundedly dangerous, it’s getting just a little bit grim, maybe on the jail borderline on that chain, the pc will criticize. See, criticism enters. And if it is so dangerous that the pc believes – you understand I’m saying pc “believes”; I’m not saying it’s factual – the pc is right up to the point where, with a jingle jangle the patrol wagon arrives, the officers pick up the battering ram, they knock down the front door, they come crashing in with the handcuffs and leg irons, you see, and drag him screaming off, towed back of the Black Maria, you see? Something like this. And they can see this is going to happen if that withhold is missing; they give you the motivator. They always give you a motivator. Flat, flat, total motivator – a hundred percent. Now, what – how do you use this? Well, it gives you the gradient scale and indexes of all cases. A case is not as bad off as he is crazy. A case is not as bad off as he is aberrated. A case is not as bad off as anything, except how dangerous he considers it would be if he revealed himself. And so you have from the top to the bottom, all cases on that gradient. Just like you have the What questions and the degree of the withhold and the safety on those – that gradient, so you have all cases on that gradient. And the person who will die before he will reveal himself is also on that scale. It’s the only reason the question exists in the Form 3 Joburg. “Have you ever thought any critical thought about____ ?” must always be followed, “Good. You have? Fine! Well, what have you done?” Because he who thinketh critical thoughteth abouteth hath done, brother, hath done. You’ll find out every time if they had critical thoughts, they’ve done something. It’s interesting, isn’t it? But if there’s anything wrong with you or if there’s anything that you feel upset about, it goes back down just to one thing. Oncet uponet a timet, you had a “withhold it.” And you never spilled it. And it is still withheld. And you is still having a hard time with it. Note: this form was revised in 1975 after Security Checking was cancelled in 1968 and later reintroduced as “Confessional” in the 70’s – the revised form follows the original in the PDF below. Now, what is an overt act? An overt act—you could classify it in various ways. You could say an overt act is something that was not for the greatest good on all of the dynamics. Something of this sort. Or something which inhibited the future survival of, or you could say an overt act was giving something an experience which it couldn’t experience. There are various ways of doing this, but there’s no reason to define it, because you know all about it! Now, that’s the trick, that’s what it’s all about. Now, the thing that was difficult to do was to define responsibility so that it couldn’t miss as a process. See, that was the trick All right. Now, we got that. Now, the other one will come out. So, there’s no sense in defining what an overt act is and therefore a moral code is just that much wasted lead pencil, stylus or wax tablet or stone or hammer or chisel or whatever it is they write them on. Because everybody knows what an overt act is or they wouldn’t suffer from them. You know, an overt act is what you suffer from, and that’s about as far as you could define the thing, you see? The thing which you are suppressing and mustn’t tell somebody must have been an overt act! See that? That’s what an overt act is. An overt act is that thing which a person feels he’d better not do again. Simple as that. Now, wherever you try to define it further than that you get into trouble. Man is basically good. He restrains himself, restrains himself, down to the point where he loses himself. And after that, unfortunately, the only real evil takes place. Having lost himself, there’s nobody there representing him but an automaton which is consciencelessly going through a series of motions, and you get criminality. So, a basic—a basic overt act could be said to be irresponsibility for identity. Well now, now we have a much worse one than full responsibility. I’ll tell you about responsibility. Responsibility isn’t very tough. It’s too easy; it is. But we’ve got one now that’s much worse than that. And yet, unfortunately, that’s essentially what I am telling you right this minute. I’m saying there you sit with the engrams this way and that way and—and the machinery going that way, and the somatic in the skull, and I say to you this horribly unsavory fact: I say, “Well, you did it to yourself. Congratulations.” And that doesn’t make you feel any better. We’ve discovered fast processing—very fast processing! Now, all you’ve got to do: The fellow’s got a great big engram. There he sits, you know? There he’s been sitting for years. All you’ve got to say to him: “All right. What have you done to the engram? What have you withheld from the engram?” you know, and it’d go phoo! But to free the pc out of that session, it’s only necessary to find out what he did to and withheld from the auditor. As far as auditing is concerned, it doesn’t matter a bit what was done to the preclear. The more attention you pay to what was done to the preclear, the less auditing and the less clearing you get done! But you were saying at the same time, “Well, pc at effect, of course, too.” Oh, no! Get off of that Get away from that horse’s head because that goes nowhere! The only effects you can experience are those which you yourself dream up to experience. That’s fantastic! It gives us a brand-new look at cause-distance-effect. The truth of the matter is more like cause-distance-cause. All is cause. The Buddhist, you know, never got this one wrapped up. And his answer to it was have nothing to do with cause and have nothing to do with effect—leave them both entirely alone—making himself, therefore, totally guilty of the sins of omission of never assuming cause, which was the surest way in the world to spin anybody in. But he knew something was wrong with this cause-distance-effect and that’s all I wish to call attention to here. He did know something was wrong with this cause-distance-effect. But what’s wrong with it is effect! Tsk You’re flattering yourself if you think you can cause an effect without the cooperation of the other fellow. All of your ability and slyness must be devoted to getting that cooperation. Now, where you have—where you have an individual who is obviously the effect of somebody, and you audit him as having been the effect of somebody, nothing happens. Now, that alone has caused us to mark a lot of time in these last ten years. We’ve gotten an awful lot done, an astonishing amount of things done in the absence of this particular datum. But now, boy, all of the time that was wasted on that, totally devoted onto this other thing— wow! Wow! Man, you ought to see cases go to pieces under this one. Zip-bang-thud! Because you’re not paying attention to untruths; there are no lies in auditing. In other words, you’re not auditing in the direction of a lie that the preclear’s condition is the result of an other-determinism than himself. You see, I could have figured this out ten years ago if I’d been that much smarter. I have to apologize once in a while for having been stupid about all this. But we could have figured it out this way: If auditing pc A in 1959 can clear up a circumstance which occurred in 1699, and the circumstance clears up without any of the personnel in 1699 being present, then obviously the person we’re auditing in 1959 did it all. If it clears up, he must have done all of it. It’s worth looking at, isn’t it? All you have to say is, “Every man in the universe is cause of his own participation,” and that’s it. And where he has participated unworthily, all you have to do is knock it out by knocking out the cause of his own participation, and you’ll free that zone of evil or mishmash or discreditable creation or whatever it is in the universe. But as long as he holds that in place, it will continue to be an evil. And as long as men hold these things in place—these discreditable participations—as long as they hold wrongdoing in place, as long as all this remains buried and knocked in the head it’s going to continue to be an evil nation, an evil world, an evil universe. You want to free it up, why—“hear ye, hear ye, the kingdom of heaven is at hand.” But don’t “repent ye, repent ye” or you will put it a long way in reverse. Now, man, by holding discreditable participations, by holding his own overt acts in place and covering them up and leaving them there, can actually cause a stimulus-response mechanism of one kind or another throughout the various dynamics, which gives life the appearance of evil. And that’s all the evil there is. Which, alarming truth, will do a lot of monks out of a job because there’s no joss to burn anyplace that will free a man’s evil. You can’t bum joss and let some deity someplace take it all on his back, because you’ve just assigned some more responsibility elsewhere, and made it just that much more difficult to blow anything! Does that appear to be reasonable? Well, all right. Why don’t people like you? That’s what all this leads up to. They don’t like you because they’ve done things to you, and there’s no other reason. You see? More than one way to prove a point. Now, you actually perform, to some degree, an overt against a person—looking at this in a very loose, sloppy fashion—by letting a person do an overt to you. And that’s about as close as you can get to performing an overt is to let somebody perform an overt against you without doing something about it. Because he’ll wind up with a mechanism which we will call lessening the overt—the mechanism of lessening the overt. The individual who performs an overt act against someone or thing, person or being has one basic mechanism for making it less harmful to himself. Remember, it’s his own overt acts that are going to harm him, so he has a mechanism by keeping this from happening and that is he lessens the object, or reduces or makes less important the object he has done the overt to. And if you want to spot an overt act, just find the critic. The critic is always the little tag end that sticks out on an overt act having been done. The person tries to lessen the overt by criticizing or reducing the thing he has done the overt to. Got the idea? Well, I’ll give you a mechanism. I come over here and I put a scratch on this podium. Now, this is a very crude example here. I put a little scratch on this podium. Actually, all I’ve done is stain it with some tears from year to year. But I put a little scratch on it, and then to make that less of an overt act to the podium or the management or something of that sort, what I do is say it’s just an old podium and isn’t much good anyway. So that doesn’t make my overt act so great, you see? Now, I can live with that overt act as long as I believe that this podium is old and not much good. But if I find out then, that the management just bought this podium brand-new—imported it from Malaysia, Honduras or something especially for this congress, and actually that it has a piece of the True Cross and the bones of Saint Peter in the thing, then I have to say, “Oh, I’m guilty of an overt act,” and decline accordingly, or recognize that I have performed an overt act and as-is it. Only that never occurred to anybody before Dianetics or Scientology. The person says, “True Cross, bones of Saint Peter,” and “Oh, my God, I’ve done it,” you know? That’s the way it’s gone. You get the idea? Well, all right. No, criticism always tells you where the overt is. It all comes out of an overt. There is practically no such thing as honest criticism. Now, there is such a thing as decent conduct and carrying our weight and all that sort of thing, but there is also such a thing as living in the vicinity of a great many people who have committed overt acts against us. And that’s rough! That’s rough. And our overt is letting them do it. Now, the easy manager—the easy manager who permits himself to be robbed at every hand is a villain, because he’s going to wind up a lot of people in the soup. He makes it too easy to have overt acts committed against himself, and eventually degrades their opinion of themselves and himself. You got the idea? Now, let’s look at this lessening the overt. When I kick the podium and say the podium is no good that lessens the overt but it also lessens my visibility of the podium. And what we have connected and collided with here, head-on, is the whole mechanism of not-isness. And that’s a discovery worth announcing. That is not-isness. Those things we have done things to, we must then not-is. And that’s all there is to it. And there goes reality and there goes engram banks and there goes visio and there goes sonic and there goes confusion of identities—one can no longer see an identity clearly and confuses it with other identities because he’s what? Got it not-ised. It means he must have done something to it, and then his second mechanism is to lessen the overt. Now, people who criticize you are trying to lessen the overt. That’s right. People who criticize you are trying to lessen the overt. People who don’t like you are trying to lessen the overt. People who are stopping you from progressing along some perfectly decent path are lessening the overt. They’re saying you don’t exist. And if they suddenly found out that you did exist, they would be suddenly and tremendously guilty of a tremendous number of overt acts. Just a couple of years ago, if it was then, one of the most profound critics of Dianetics and one of the fellows who had—did the most to Dianetics to slow it down and who got paid the highest went up to the Mayo Clinic and kicked the bucket. Now, that’s the hard way to go out! I’m not holding him up as a horrible example. I’m trying to show you this mechanism of lessening the overt. Because it lessens, it lessens, it lessens, it lessens and then can’t hold it, can’t hold it, boom! And it just goes in reverse. And the terminal it’s done to goes up, and the person goes down. And we get the exact mechanism of propitiation: Not-isness reversed. See that? It just goes bang! It’s a horrible thing to watch. Now, somebody’s been expecting this to happen someday in Scientology and Dianetics. No, let’s fool everybody and take it the other way. Let’s just get them all by the scruff of their necks and run out their overts in life and straighten them up and make them walk proud. And you watch, now. That’s what’s going to happen, that’s what’s going to happen. Therefore, one of the first things we ought to do is to make sure we are a third dynamic which is sufficiently trustworthy, sufficiently straightened up and dedicated and representing what we say and do in ourselves to a degree that it will inspire confidence. Now, the mechanism is that man is basically good, and when he suddenly discovers that he is guilty of evil, he takes himself off so he can do no more harm. And that’s the mechanism of blowing. That’s the mechanism of sudden departure. That’s the sudden departure from an auditing session. That’s the sudden departure from an auditing session. So you’re going to see some things that appear to you to be punitive. For heaven’s sakes, don’t interpret them as punitive! All we’re trying to do is get anybody who holds a certificate anyplace to hold it with clean hands. That’s all we want. Any case who comes to us for processing must be processed by an auditor who has clean hands or that auditor, by the way, will not locate their overts! It’s the darnedest thing you ever saw. That is tacit consent! And as we know, then, we’ve got this one and that one and the next one all straightened up, we can simply mark them “Clean hands,” “Clean hands,” “Recommended without reservation.” And that way Scientologically, as auditors, we can straighten it up, but also fieldwise. It isn’t that we’ve got to be a clean group; it’s that technically we now recognize that the only way we’re all ever going to get Clear is to be a clean group. Do you get the difference? Well, it’s a brand-new look. It’s got some jolts in it. But there isn’t anybody under the sun going to be punitive about it. Nobody’s ever a punitive when they can be effective. If you criticize someone, it is because you have committed overt acts against them (you have done something bad to them) or because they nearly found out about your past overt acts which you don’t want them to know about (missed withhold phenomena… supposedly). If someone did something bad to you and you are complaining about it (motivator), it is because of your own overt acts of similar nature (you did something similar to that person or someone else). If you are thinking about leaving or have left an area (marriage, job, a town, or especially Scientology), it is because you have committed overt acts against that area. If you are trying to explain why you did something, it is taken as justification of having committed an overt act. If you are suffering somehow then you are really doing it to yourself because of your overt acts. If you feel sympathy for someone, it is because you have committed overt acts against them or someone who they remind you of. So apparently, it is complaining, criticizing, explaining, or suffering that establishes the level of someone’s fault or “guilt” in having done something wrong. Inability to independently evaluate other people or Scientology itself due to misconception about criticism. Inability to fully confront and take (true) responsibility for the actions of others and so becoming easily overwhelmed by them. Inability to simply recognize the suffering of others or properly acknowledge that of one’s own. Inability to properly acknowledge and duplicate unfavorable evaluations since criticism is viewed as a sign that there is something wrong with the person criticizing as opposed to something that is being criticized. For this reason, Scientology is closed to any real improvement and criticism toward it continues to accumulate since it does not get properly acknowledged and addressed. To add insult to injury, Hubbard asserts that overts and withholds are a symptom of already existing irresponsibility [HCOB 18 FEB 1960: HOW TO RUN O-W AND RESPONSIBILITY], yet looking at the actions of another for which one should be taking responsibility for is considered “being a victim” and one is asked to look at one’s own actions only. This practice then produces further IRRESPONSIBILITY which increases the chance of more actual overts and withholds down the road. 1. DO NOT EVALUATE FOR THE PRECLEAR. The main difficulty of the preclear is other-knowingness. An auditor auditing a preclear has before him someone whose last stronghold of owned knowingness is his engram bank and various mental phenomena. As much as possible, the preclear should be permitted to discover the answers to this phenomena through the process of auditing. What the auditor is doing is steering. If he tells consistently what is to be found or what will happen, the preclear will not get well. The steering, of course, is a covert but highly acceptable method of inviting the preclear to find out. Giving a process’s commands is an invitation to this discovery. The auditor is working from a body of knowledge as to how all minds and spirits function. The preclear could even be trained in this high generality without harm, and certainly can be audited in such a high generality, but its particularities and peculiarities, the phenomena which occur, must not be “telegraphed” to the preclear before they occur, and when something has occurred to the preclear the auditor should not then come up with its explanation. This was the entire failure of psychoanalysis. The preclear would say something, and the analyst would then tell the preclear what it meant. The auditor should confine himself to giving the proper auditing commands and engaging in enough “dunnage” (extra and relatively meaningless talk) to maintain a two-way communication line. 2. DO NOT INVALIDATE OR CORRECT THE PRECLEAR’S DATA. After a preclear has informed the auditor of an incident in his life it would be a fatal error, so far as the preclear’s case is concerned, for the auditor, using other data, to inform the preclear that he did not have a proper recall on the incident. This is the main trouble with husband and wife auditing teams, and why they normally do not work. Both have been present under various circumstances, and the husband or the wife doing the auditing on the other may find it impossible to repress his or her own version after the other one has delivered up an incident. Today’s type of auditing enters incidents minimally; therefore opportunities of this kind are not as frequent as in earlier days. Verbal invalidation is, of course, the symbolic manifestation of force. Invalidation, when expressed in emotion and effort, is force. When the preclear is invalidated he feels as though he has been struck by some force. One of the lowest levels on this line of invalidation is criticism. Lacking the effort or energy to hit somebody, a covert person criticizes or otherwise invalidates. …the auditor who becomes interested in his preclear’s motives and makes evaluations of his preclear’s reasoning is not only wasting his time but is trying to perform authoritarian therapy. The auditor never evaluates the case for the preclear. He abstains from this, knowing that to compute for the preclear is to inhibit the preclear’s own computation. He knows that to refresh the preclear’s mind as to what went before is to cause the preclear to depend heavily upon the auditor and so to undermine the self-determinism of the preclear. The auditor never invalidates any of the data or the personality of the preclear. He knows that in doing so he would seriously enturbulate the preclear. He refrains from criticism and invalidation no matter how much the auditor’s own sense of reality is twisted or shaken by the preclear’s incidents or utterances. The auditor uses only techniques designed to restore the self-determinism of the preclear. He refrains from all authoritarian or dominating conduct, leading always rather than driving. He refrains from the use of hypnotism or sedatives on the preclear no matter how much the preclear may demand them out of aberration. He never abandons the preclear out of faint-heartedness about the ability of techniques to resolve the case, but persists and continues to restore the preclear’s self-determinism. The auditor keeps himself informed of any new skills in the science. If a PC expresses criticism toward somebody, criticism being disapproval based on perceived faults, an auditor is instructed to ignore PC’s data and go digging for a supposed “hidden cause” of his or her criticism in the form of something bad that a PC must have done. Maybe, if someone just walked in the door and have never heard of this “rationale,” that person may not feel invalidated and evaluated for that much when asked “What have you done to __?” after expressing a complain about somebody, but any Scientologist learns about this principle sooner or later and operates in the Church with a continuous invalidation hanging over one’s “bad thoughts” and a sense of introversion on the supposed wrongs within oneself. It also violates some key Scientology axioms as it forces the PC to look at one’s own actions alone and discourages or even prevents the PC from looking more thoroughly at someone else and their actions as well as any target of one’s criticism. 30. THE GENERAL RULE OF AUDITING IS THAT ANYTHING WHICH IS UNWANTED AND YET PERSISTS MUST BE THOROUGHLY VIEWED, AT WHICH TIME IT WILL VANISH. 32. ANYTHING WHICH IS NOT DIRECTLY OBSERVED TENDS TO PERSIST. It is no wonder then that conflicts in Scientology never actually resolve – they just continue to accumulate. 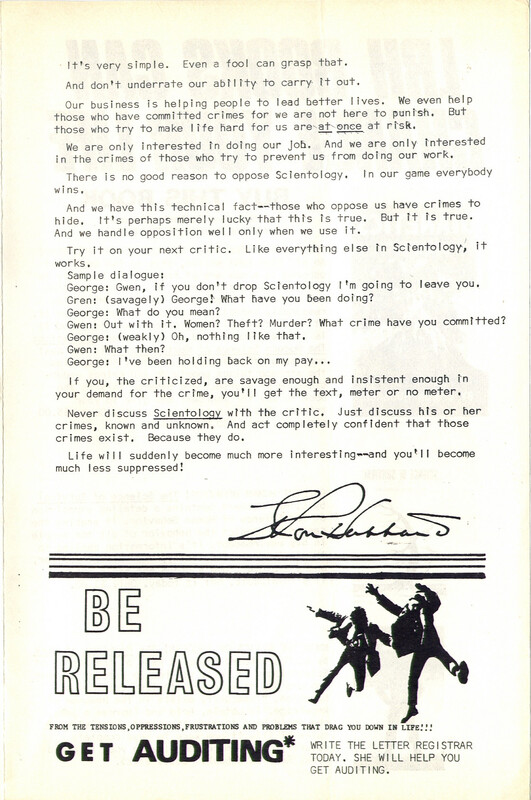 Most importantly, Scientology Confessionals or Security Checks is a form of FORCED (OR COMPULSORY) COMMUNICATION; after all, with is a WITHHOLD if not a subject’s unwillingness to communicate about something – an unwillingness that must be broken according to Hubbard’s directions. This could be far more damaging than inhibited communication. If you are not allowed to communicate something, at least you can still dwell in your spiritual space within. 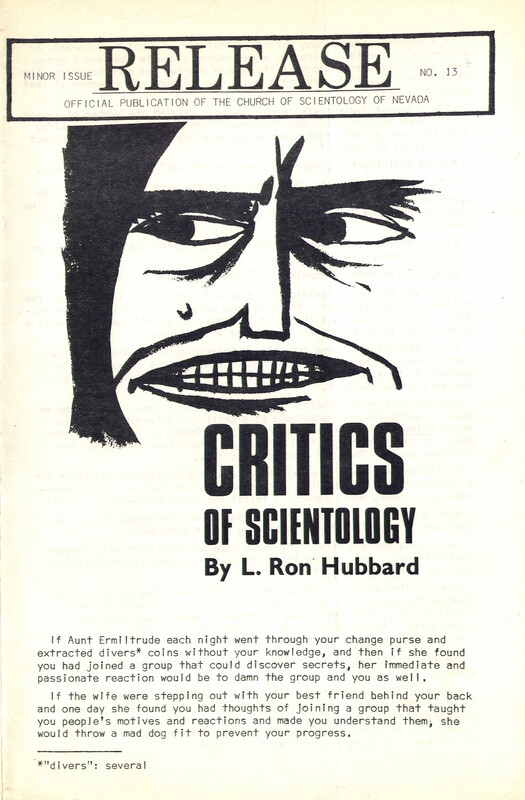 With a Security Check, the subject’s mind is essentially pried open, coercively, just as Ron Hubbard instructs which, in essence, is a practice of breaking the subject’s will and is destructive of psychological integrity of an individual. And with Scientology it is a double fault since communication is both forced in one area such as with information concerning one’s personal life and inhibited in another such as with respect to expressing criticism toward anything related to Scientology itself. Let’s see what Hubbard himself says elsewhere on this subject. 11. Never regret yesterday. Life is in your today, and you make your tomorrow. Hubbard’s Code of Honor is actually quite impractical in view of operating out in the real world, but this is cited here just to show how he wrote a Code and then developed a practice that was going to force parishioners to break it. All of the past psychotherapies are aimed at getting a person to outflow, and what do we find here? We find that intelligence increases and neurotic personality traits get better when we run withhold communication from valences. It is a fantastic reversal. We found this to be the case: that people from whom one felt that one could not withhold anything were the most aberrative valences on the case. We thus have a new definition for aberrative valences, namely the “cannot withhold from” valence, who is the most aberrative valence on the case. As you run it the preclear will say, “Well,” unreality, unreality, “I don’t seem to be able to withhold anything from Aunt Grace at all.” Ask a criminal what he could withhold from jail and he will find that he cannot withhold anything from jail. He will see facsimiles and other electronic phenomena sweeping towards some spot he considers jail since he is unable to withhold anything from jail. We are looking at the basic anatomy of the track and the basic process by which one would run a track. You could be sitting in the middle of the trap and just dream it up for a while and say, “How did I get in here? I don’t know.” The only way anybody could keep you in a trap would be to give you the idea that you had to surrender to the trap and the way to undo this would simply be to think of something you could withhold from the trap—or track. 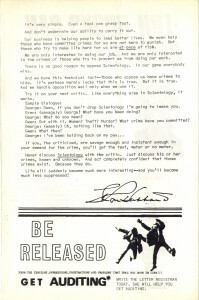 It is indeed strange that following this bulletin Hubbard integrated interrogation techniques into the practice of Scientology so a group member would not be allowed to withhold anything from the group effectively making it an “aberrative valance” according to Hubbard’s own terms. And this would apply to ANY Scientology group in or out of the Church. In fact, every auditing session which is at the core of Scientology practice starts with checking the person for withholds under “rudiments.” If someone has withholds against the auditor or the group at large, this is called OUT-RUDIMENT (out-rud) and the person is considered non-sessionable – i.e. unable to continue with the practice of Scientology until those withholds are cleared. Your first skill is your Security Checking skill. Your second skill is your assessing skill. The demand of the technology is that the auditor be absolutely right, he be correct in what he does. Now, he has to do some adjustment of what he does, but it breaks down to these two precise skills. One, the ability to pull withholds and to handle an E-Meter and run this type of processing check on the preclear. That is a skill and it is a precise skill, and that one cannot be done wrong. You leave a withhold unpulled on the pc and you have hell for breakfast thereafter. All you’ve got to do is miss a withhold. So that Security Checking has to be perfect. The reason fellows get upset, the reason people blow, the reason people have ARC breaks, the reason they have bad sessions, the reason for this and this—isn’t really that the auditor’s intention was bad. It was only that the person had withholds and nobody got them. They asked for them and didn’t bother to collect them. And somebody comes close to these withholds and we believe implicitly, you see, that if we got off this withhold, naturally we could just see the police running in, my God, the sirens going in all directions, you see, and police by the squad coming bursting in the front door, probably with battering rams, you know? And they got handcuffs and they’re all ready to put them on you, you know, and drag you off. And naturally the cell they’re going to drag you to is not any of the modern jails, you know, which just dramatize withholds; it’s probably one of the old-time dungeons, you know, where they bury you up to the neck in water and leave you there for forty years or something like this, you see? You get an aberrated idea of the punishment in a jail. And this all of a sudden rekindles, you know? The auditor gets close to one of these things, and this idea, ooooooh! you know. Oooo-oooooo-ooooo-ooo, you know? At any minute this horrible series of circumstances are going to occur, and naturally we consider the auditor dangerous. No, listen, the auditor is only dangerous if he doesn’t pull the withhold. And that is a recurring phrase that is starting to happen here in this school. There are certain auditors that we designate as dangerous auditors. Why are they dangerous? Because they will only tick and not pull a withhold. And we call those people dangerous auditors. Why? Their pcs are all going to be mad at them, they are themselves going to goof up and get lots of loses one way or the other and they’re going to always be involved in ARC breaks of some kind or another and they’re going to have people going around gossiping about how bad Central Organizations are and how bad they are and how bad everything else is and so forth. And they are dangerous. But from the pc’s viewpoint, the person becomes dangerous the moment they might find out whatever this thing is, you see? And the auditor appears for a moment dangerous. The auditor might find out. And the pc gets ARC breaky, however, only when the auditor fails to find out. The auditor has to go the whole way. And an auditor who won’t go the whole way, an auditor who will only get off safe withholds off of a pc is dangerous. And that is today’s adjudication on whether a person can audit or not: Are they a safe auditor or a dangerous auditor? Oddly enough, it’s a complete reversal. The auditor who gets off safe withholds is dangerous. And the auditor who will get off unsafe withholds is safe. You understand that? It seems that Hubbard is indicating here that the “missed withhold” phenomena is brought about in fact due to restimulation of past incidents when the person was punished such as having been tortured, imprisoned, and/or executed at some point in a past life or perhaps due to experience of lighter incidents this lifetime. In this case, having done something that could be considered wrong and judged by others serves as KEY-IN of earlier incidents of punishment. This is something that would make sense and is perfectly in line with the initial premises of Dianetics – then why not use Dianetics to address and discharge those incidents so that someone doesn’t keep getting restimulated on them in the first place? Why force the pre-clear to communicate something which he (or she) believes he should not? Why not address the reasons and the underlying charge that makes the person feel overwhelmed on the subject to begin with so that he or she recovers one’s self-determinism and then can decide rationally about communicating or not communicating something? Instead, Hubbard placed emphasis on having no withholds – how convenient! There are places where Hubbard actually states that the aim is to rehabilitate someone’s ABILITY to withhold, but how can this ability be practiced in Scientology is quite unclear. If you think of something and say: “Well… yeah… I don’t want to talk to you about this right now.” Bam! This is a potential “missed withhold” if it isn’t “pulled” which is a huge “no no” in Scientology and the said reason for all that can go wrong with one’s auditing session and one’s relationship with the organization. Depending on that person’s position in the organization, the person can literally be restrained in a room until he or she “confesses” – this is especially true when it comes to members of the Sea Organization. As anything Scientology, it continues to get even worse. In the early 1970’s Hubbard figured out something very important about the mind and issued the infamous INTROSPECTION RUNDOWN [PDF: it is important to look at the initial version of this reference which contained a much simpler and shorter procedure than a later revision – both versions are included in the PDF]. The Introspection RD is one of the key references in understanding what is wrong with Scientology itself. Unfortunately, it has gained a very bad rep due to some heavy negligence that resulted from its application. These are covered at length elsewhere on the Internet. What we are going to focus on here is some of the useful key points in the reference.
. . . CAUSED the person to look inward worriedly and wrestle with the mystery of some incorrectly designated error. The result is continual inward looking or self­ auditing without relief or end. In the case of a pc in a psychotic break, the C/S would have to locate the last severe wrong indication, indicate the fact to the pc and get it corrected (as with a wrong item) as the first action. The end phenomena of the Introspection RD is the person extroverted, no longer looking inward worriedly in a continuous self-audit without end. Also, a Psychotic Break is a complex condition. It doesn’t have to be someone running around like a raving lunatic. A person could be sitting quietly doing nothing and yet be suffering immensely from a deteriorating condition of one’s mind. Though there is a lot of different information covering this condition on the Internet, a Psychotic Break could be best understood as one’s loss of control over one’s mind and a compromised sense of reality. There could be various degrees of this condition and someone could go on coping with it literally for years if it does not completely prevent that person from continuing to engage in regular daily activities. A person who recognizes there is something off with their mind could still maintain enough self-discipline to maintain a normal line of behavior. Quite coincidentally and maybe not so coincidentally, a person having lost some control of their mind will naturally yearn for a more organized activity and yearn to be “directed.” This is the next step up in dynamics from the state of Entropy into a state of Robotism and unfortunately could be the very state where many Scientologists will find themselves due to the gross errors in its theory and practice as discussed on this page. Responsibility is the ability and willingness to assume the status of full source and cause for all efforts and counter-efforts on all dynamics. It means responsibility for all acts, all emotions on every dynamic and in every sphere as one’s own. Complete negation of responsibility is complete admission of being under the complete control of the environment. These counter-efforts exist and are effective on you to the exact degree that you don’t take responsibility for them. The responsibility level of the preclear depends upon his willingness or unwillingness to handle energy. That preclear who is protesting against energy in any direction is abandoning responsibility in greater or lesser degree. Now, a fellow is — we’ll cover responsibility very heavily, but when a fellow won’t take responsibility for an energy, he becomes an effect of it. LET US BE PRACTICAL. A science is not a science unless it is practical. A theory is no good unless it works. All the fancy and beautiful theory in the world is useless unless it has a use or a workability. Is this CYCLE OF ACTION THEORY USEFUL? It is. So long as we believe that we have to destroy with force in order to destroy at all, as long as we think in terms of destruction, we have chaos. There is CREATING AND KNOWING ONE IS CREATING. There is CREATING AND NOT KNOWING ONE IS CREATING. When one drives a car or a cart he does many things (performs many acts) which he is not AWARE OF (conscious of, knows about), and these we call AUTOMATIC ACTIONS. One is doing something and is not aware that he is doing it. One starts to create something, then places this thought still active beyond his own reach and the creation continues to occur. KNOWINGLY CREATING SOMETHING is always the first condition. One can then purposefully CONTINUE THE CREATION UNKNOWINGLY. Everything one is doing knowingly or unknowingly one is doing here and now, in the present instant, in present time. ONE KNOWINGLY STARTED ANY CREATION in some PAST moment. But the Creation is being done in the present moment. To stop any creation it can be established that one once knew one was creating it— finding that thought and making it known again—OR ONE CAN SIMPLY CREATE NEWLY AND CONSCIOUSLY WHAT ONE IS ALREADY CREATING UNCONSCIOUSLY (unknowingly). In either case the creation stops. The WRONG WAY is to start a new creation to counter against the old creation; when one does this he gets confusion and chaos. FOR EXAMPLE, a man has a bad leg. He is trying to “get well”. He seeks then to create a good leg. He goes to doctors and wants to be healed. The treatment is difficult and usually somewhat unsuccessful in the case of a very severely crippled leg. SOMETHING is creating a bad leg. Against this he is creating a good leg. The result is confusion and a bad leg. BUT a THIRD creativeness is present. First something was creating, we hope, a good leg. Then a counter-creation (such as an accident to his leg) counter-created a bad leg. Now he is trying to counter-create again a good leg. The result is to wipe out the ORIGINAL GOOD LEG since THAT IS THE CREATION HE IS TAKING OVER AND EXPOSING WITH HIS EFFORTS TO GET WELL. He wants a good leg. The trouble with him is the counter-creation of a bad leg. The test is factual. Have him create (by a certain Scientology process) bad legs until the counter-creation of bad legs is wiped out and the ORIGINAL CREATION OF A GOOD LEG WILL REAPPEAR. This only fails when there is no original creation of a good leg, when the original creation of a good leg is gone. In a very strange move in 1960, the concept of responsibility became not about taking ownership over all actions, thoughts, and emotions and not about willingness to handle energy in ANY DIRECTION, use force or make decisions about something, but simply about ADMITTING to what an individual HAS DONE or about what he or she did not communicate (withhold) about having done something. The whole attention collapsed on one’s own actions only and only in real terms, without the freedom to consider the possible actions one COULD do – since that fell under the general category of Creative Processing which was now effectively prohibited. Looking at the actions of others was now considered NOT taking responsibility and framed with various unfavorable labels such as motivating, justifying, being critical or “nattery,” fault-finding, being a victim, being effect, or whatever else. It should also be noted that accusing someone of NOT TAKING RESPONSIBILITY is a form of evaluation for them which would be a break of the Auditor’s Code. Notice, how in “The Key to All Cases” reference, Hubbard claims to having made a “discovery” about responsibility even though a much better understanding of responsibility already existed for almost a decade. Responsibility as a word can still be used as itself in an auditing command. Next, but not next in importance was the discovery of the anatomy of RESPONSIBILITY. Although Responsibility has been known as a case factor since 1951 (just as the overt-motivator sequence has been) it has not been until now that I have been able to get it to run well on cases. Basically, then, when one is processing a pc, one is seeking to rehabilitate a willingness to do. In order to accomplish this one must rehabilitate the ability to withhold on the pc’s own determinism (not by punishment) further bad actions. Only then will the pc be willing to recover from anything wrong with the pc—since anything wrong with the pc is self-imposed in order to prevent wrongdoing at some past time. All types of responsibility processes have this as their goal: to rehabilitate the willingness to do and the ability to withhold on one’s own determinism. In every one of these instances it begs to ask – BUT WHAT ABOUT THE OTHER SIDE? What about PC’s observations, thoughts/postulates/considerations about the husband, the auditor, the mother and their actions… etc? What about taking responsibility for “all efforts and counter-efforts?” Well, Ron said it: “…it doesn’t matter a bit what was done to the preclear” placing the act of looking at the actions of others in his “being a victim” or “being effect” framework, yet it is WHEN the actions of other people are not confronted and addressed, one can become MORE at effect with respect to them. This was made very clear in 1950’s D&S materials. In addition, it could also be found that by taking greater responsibility for the actions of others, individual’s responsibility for one’s own actions also comes up. In effect, using 1950’s definitions, what someone would have to do is take responsibility for (RE)CREATING THE EXPERIENCE or the perception of someone else’s actions, thoughts or emotions that one may be bothered by. And taking responsibility for the creation of an experience (if only in the form of a memory recording) would obviously result in a heightened ability to perceive and handle similar experiences as they unfolded in present time. In some researches I have been doing recently on the field of study, I have found what appears to be the basic law on complexity. THE DEGREE OF COMPLEXITY IS PROPORTIONAL TO THE DEGREE OF NON-CONFRONT. 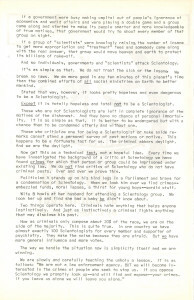 Hubbard seemed to have attempted to correct this problem in later years with the following bulletin: HCOB 05 AUGUST 1986: CHANGE OF COMMANDS – OVERT-MOTIVATOR SEQUENCE (PDF), but as the saying goes “it was too little, too late.” The same could be said about another bulletin that many Scientologists probably do not even know exists – HCOB 02 JANUARY 1971: ILLEGAL AUDITING (PDF). And thinking about Hubbard’s claim logically, if bad actions of others toward you are caused by your past overts then wouldn’t your bad actions toward others be caused by their past overts? This of course is absurd since it discharges conscious choice on the part of either party, yet it is not uncommon for Scientologists as a group to blame the recipients of their own destructive actions for having caused them in the first place. In this wise, the Overt-Motivator Sequence rationale seems to actually produce the very phenomena that it describes where the indoctrinated commit overts and then rationalize that they would not have committed them if the recipient did not have some past overts to “pull it in” in the first place. This is especially “effective” in a group setting where one member of the group commits harmful actions and another group member suggests to the recipient of those actions as having pulled them in. This is a downward spiral of the social dynamic within Scientology. Another aspect to this is that an individual won’t be able to duplicate or take responsibility for (assume power over) the actions of others (or any form of expression) he or she is unwilling to create – this could lead to a sense of being overwhelmed by the experiences of those actions. This then directly ties into the PTS/SP technology where someone would believe themselves to be a victim of someone else’s actions due to being unwilling to take responsibility for the reality of those actions one on side and due to conditioned perception of nature of the person or group committing them (as being “suppressive”) on the other. So in the end, the Overt-Motivator Sequence theory and practice actually ends up inhibiting responsibility for one’s own (especially those considered “overts”) actions and those of others – the exact opposite from where Scientology should be taking people. Responsibility for overt acts is restored by liberating individual’s considerations of committing (creating) them. This can be done with questions directed at specific targets, areas, or toward the actions themselves. How could you harm/destroy/attack self, family, group… etc. (general areas of the dynamics) or specific targets such as Ron Hubbard, the Church, your bridge progress… etc. Who or What would you like to harm/destroy/attack? Who or What could you harm/destroy/attack? Who or What have you harmed/destroyed/attacked? The basic assessment for Creative Processing started with questions: What can you not (or are unwilling) to destroy? What can you not (or are unwilling) to create? and are good questions to pinpoint specific areas of address. That’s why true confessional should be based on REGRET not on whether someone has done something that could be considered harmful or destructive as Regret was also an instance when one decided he no longer wanted to be responsible for the misemployed counter-effort which could then effect him as a (keyed-in) counter-effort. I want to talk to you about overt acts, motivators and the DED. Although you will find the sequence I describe to you invariable, the conditions resulting from it are quite complex. There are three circumstances. An individual has something done to him and then he turns around and does it to somebody else or something else. And then he says, “I shouldn’t do that,” so he holds himself from doing it again and he brings the first time it happened to him and the time he did it close together and they wind up in a ball no matter whether they’re ten billion years apart or ten minutes apart. They’ll wind up. One is the motivator, the next is the overt act-the same, similar efforts. Person receives an effort and he thinks he ought to be able to use any effort he has received. We get this sort of situation here: I showed you the dish and the tennis ball circumstance here. In comes this effort. Now, if it comes in and hits him, he makes a facsimile of it, he feels he should be able to put that facsimile into play at any time. And so one day he starts to put this into play and we finish the cycle – it gets there and he says, “No!” And when he says no there, he says no there. In other words, he stops the thing coming in and going out if he stops it going out. Why? Because when it was a counter-effort he stopped it and tried to stop it from coming in. So what does he use to stop it from going out? The same force that he used to keep it from going in. So, this one as it starts in here at the top, it’s coming toward him – this is earlier on the track – this is the motivator and this, of course, is antipathetic to his survival, being a heavy counter-effort. And as it comes in he says, “No, no, no, you must not come in.” And he tries to force it and keep it from coming in, but it comes in anyhow. And he makes facsimiles of it coming in and his stopping it and his being unable to stop it. He makes a facsimile of every sequence of the entrance to him of this counter-effort. Now, once upon a time – or a little bit later, “then” upon a time – he will say that “This is a similar situation. I’m going to do it to somebody else. I want to put this person in apathy,” he’ll say, “and here’s a facsimile of a good, strong counter-effort. I’ll give him this good, strong counter-effort.” And he’ll start to give him this good strong counter-effort and you’ll get a cogeneration of energy there. And he’ll say all of a sudden, “I don’t want to put him into apathy, really, because he is me and I am him, because here it’s happening to him and it happened to me, so therefore I must be the same as him.” And this is very simple and very sensible. You’ll find all people who get motivators and try to use them as overt acts come to this conclusion that “I am he,” until they get a cross-identification across the whole human race. They think everybody is them and they pick up everybody’s facsimiles and they pick up all sorts of restimulations. They don’t pick up anybody’s facsimiles; that’s a very special activity. You can grab somebody’s facsimile, but you’re not grabbing his facsimile at all-you’re taking a photograph of his facsimile or you’re pushing him through his own facsimile. You’re not taking his facsimile, it’s different. Now therefore, people, when they’ve have lots of motivators which they’ve tried to use as overt acts, will eventually come to the conclusion that they and the rest of the human race are the same person. In other words, their own individuation is squashed. Why is it squashed? In comes a counter-effort, they stop the counter-effort from coming in. They make a facsimile of it. They start to use it one day. They want to put somebody into apathy or put somebody out of action or nullify them-something is happening. So they take this thing that happened to them and they say, “Here it goes” and start to use it and they find the other person putting up the same resistance they put up, which identifies them with the other person because of an interchange of energy. There’s an actual energy flow and this other person says, “No, no, no!” The person who is doing it to them feels “No, no, no!”-as an energy flow, not the words or anything. There’s an actual energy kickback. And the second this kickback hits, it restimulates very mechanically the other side of this motivator. So it makes the person who is doing the overt act the same as the victim. It gives him a confusion of identity. And the second he gets this confusion of identity, he says, “No, no, no. I mustn’t do this to me.” And so he holds it up. And he tries to say, “I didn’t do it,” and he tries to pull it back. He gets regret. Regret is the action of trying to make time run backwards. And so he holds it up and here it was on the way out. But here is a facsimile now which is holding it up. Who’s he? Is he the person who is holding it up or the person who is putting it out? Well, he must be both people. Well, if he’s both people then he can feel sympathy for the person he was doing it to. But, of course, if he feels sympathy for the person he was doing it to, this makes him the same as the person he was doing it to, because anything you feel sympathy for, you identify with yourself. So it becomes an immediately unsolvable situation unless you have the reduction and erasure techniques of processing – Dianetic processing. If you have these techniques you can resolve this. It couldn’t be resolved before. So there we are. I ran some clinical experiments on this to find out if you could run overt acts through just by running overt acts through. And it’s pretty hard to do. It will happen, but the person insists on running the motivator – running the time it happened to him. So the fastest way to do it and the way to do it now, according to procedure and according to test, is you run him choking somebody and then you run him being choked. You run him being choked himself until such time as you find it getting very sticky indeed. You know, slows down-starts to be hard to audit. First moment it starts to get hard to audit, make him choke the other person. And he starts choking the other person and make him choke the other person till that gets a little bit hard to audit and then get him choked himself. And you’re reducing them selectively, each one to each one’s level. And if you run one of these overt act-motivator ballups on the track that way, you will find out that you’ll get a very speedy reduction. They’re very fast to reduce, then, so you don’t have to work on it for hours and hours and hours. Want, to talk to you tonight about the resolution of effort and counter-effort. The only reason an engram will not run and the only reason a moment of pain, the only reason a moment of unconsciousness will not reduce properly or erase properly is in the matter of effort and counter-effort. Effort and counter-effort form a heavy-enough block on some engrams they become very difficult to work out. Of course, you understand there’s another item and that is one’s own intention or one’s own self-determinism with regard to it. It matters much more what the individual says than what is said to him. So one’s own self-determinism can be a large factor in auditing out an engram. But the effort and counter-effort are actually what hold it down because they sort of wrap up the self-determinism, they sort of lie around it. Self-determinism can get swallowed up by effort and counter-effort. Such a situation as this: An individual comes out of a door and somebody else comes in the door and they collide. Well now, each one has the intention and postulate of progressing forward in the direction he’s going and they collide. And they stop for a moment. And to A, who is coming out of the door, B is a sudden counter-effort. And to B, going in the door, A is a sudden counter-effort. The two of them meet, maybe bump their heads together, both of them would go unconscious. You see, unconsciousness is actually a manifestation of one’s self-determinism being upset by a counter-effort, that is what unconsciousness is. The equation one works on, actually, is “If I can’t make my self-determinism count, then I must be dead” and he goes down curve rapidly toward death. Unconsciousness is just a-light or deep-is merely a slide in toward death. Now, effort and counter-effort, then, contain a very large part of the answer of auditing out an engram. Your preclear can get so bogged down in some postulate, in some statement he makes himself, underneath this effort and counter-effort-that he’s made when he received it or made just before he received it-that he will concentrate in such a way on this effort and counter-effort that he does not pick it up. Now, that may seem to you rather odd that you could concentrate on a counter-effort and be, then, unable to contact it. The trick is to concentrate on another point than the point of impact and only then will the counter-effort come in. The reason for this is very simply expressed. One’s own effort is always to some slight degree directed toward the receipt and expulsion of counter-efforts. Now, the receipt and expulsion of counter-efforts requires that one fix his attention upon the counter-effort. And one’s attention, therefore, is fixed on the effort in order to expel it. What is actually happening is you are no more and no less than a complete bundle of counter-efforts. Thought picked up its first counter-effort way back at the beginning of time, turned it around and used it to overcome the physical universe. And this sequence: picking up a counter-effort and then using it, picking up a counter-effort and then using it, picking up a counter-effort and using it, should demonstrate to you that every effort which you exert has, at one time or another, been a counter-effort. A physical-force effort then has, at one time or another, always, in every case, has been a counter-effort. The only reason a counter-effort in a facsimile becomes troublesome is because an individual’s self-determinism depends to a large degree upon his right to use any counter-effort he receives and turn it around and send it the other way. Now, he thinks of himself as having this as an inherent right. Therefore, when he receives a counter-effort and is then inhibited in using it, the counter-effort will eventually come back against him because he will go back to the point where he realizes the counter-effort is dangerous, he’ll start examining it and he’ll throw himself back into the first facsimile of its receipt. This is highly mechanical-very, very mechanical. Now a counter-effort then, let us say, of being hit hard by a truck, to use a very standardized thing (hitting by a truck is quite ordinary these days, drivers being what they are, particularly in Kansas) – so your counter-effort comes in, bam! The point is that one has received a counter-effort which he cannot employ and so it’s worrisome. Well, there are two things to do about it: one is not to get hit by a truck and the other one is, if hit, be in a high enough tone so that that facsimile, being in the counter-effort band, won’t ever be contacted by you anymore-or audit it out. Now, these are several courses that you can take. All right. Here is the matter of receiving a counter-effort and not being able to use it. An individual is killed, let us say. I hope that doesn’t sound particularly amusing to you-he’s killed and later on can’t use the counter-effort, but that’s exactly what happens. The individual is killed, let’s say he’s strangled, and later on somebody does something to him and his response is to take his lily-white hands and strangle the other person. Well, when he says to himself, “How could I have done this?” he starts picking up the facsimiles which gave him the counter-effort which permitted him to do it. And of course, he hangs up with the first time it was done to him. And we call this first incident, when it was done to him, the motivator. The motivator is then employed and may be employed relatively successfully. He can go around choking animals, choking horses, choking anything, it doesn’t matter, choking men-they’re all on a parity with him-it just doesn’t matter. He doesn’t regret these fellows. And then, one fine day, he chokes the wrong person, which is to say, he chokes somebody that is not a legitimate target, which is to say, he has no justification for the act. Insufficient justification creates, then, what we call the overt act. An overt act is the misemployment of a counter-effort – the misemployment of a counter-effort. And the counter-effort thus employed against a target that is not a legitimate target, backfires on the individual. He’ll go back down the time track and get into the motivator. He gets into the motivator immediately. He gets the somatics, plainly and simply, that were administered to him. He gets those somatics himself. Thus you find, on the track, a person begins to accumulate overt acts – many of them. He maybe has one big motivator, one incident that he can’t do anything about. He has received a counter-effort and every time he tries to use this counter-effort, which is his perfect right (he thinks), he finds out that it is such a large offense against the other dynamics that he pulls back and resigns his right and he cannot, then, be self-determined. So his self-determinism sinks because he can’t use this counter-effort. As a result, the accumulated overt acts can get up to a point where the individual will suffer no matter what he does to anybody. He begins to believe that he cannot use a single counter-effort. This is a condition we know as apathy: all counter-efforts go through and one puts up no effort to resist them. That is apathy. That is also refusing to use one’s right to utilize counter-efforts. That’s the bottom of self-determinism, then. One can’t use a counter-effort, therefore one has no self-determinism, therefore one is in apathy because all efforts go through him-all counter-efforts go through him. The Tone Scale – the whole Tone Scale can be derived on these emotions to this degree: how much overt action has the individual suffered from? That is to say, how many times has he failed when he tried to employ a counter-effort? The degree to which he is unable to employ counter-efforts is the degree or the band he lies in on the Tone Scale. Should be very simple, very easy to understand. If a man can’t use any counter-efforts at all, he cannot resent anything that’s said to him, he cannot strike back at anybody that does anything to him, he is incapable, then, of defending himself or the other dynamics and, as a result, more or less ceases to exist. That’s apathy. The bottom of apathy is death. One then won’t even resist the counter-effort of sunlight or anything of the sort. Now, way up the band, one is so extensional against counter-efforts that they really don’t even arrive. They don’t arrive. He not only is capable of employing all counter-efforts, he doesn’t need to, he’s way up above. Now, when a person, let us say, is well up the band, let us say that he begins to use, for some reason or other, counter-efforts-he uses some old counter-effort against one of the dynamics. He comes down the band a little bit. He uses another counter-effort against one of the dynamics. You see, it’s non-survival to go out against the dynamics – it’s not good sense! So, he uses these counter-efforts and he uses them and he uses them and he uses these motivators, one after the other, and gradually uses them wrong this time and wrong that time and comes, eventually, down to the bottom of the Tone Scale. In order to audit him back up again, one could, actually, merely pick up his overt acts. You can locate them on a psychometer. His overt acts. What has he killed and when? When has he misemployed counter-efforts? Against what? Against himself, against children, against women, against groups, against Man, against animals, against the MEST universe and so forth, right straight on up the line. Particularly interesting is the counter-effort against Seven, theta-the Seventh Dynamic. The overt act against Seven is very interesting because it results in an individual believing he has offended to such a degree that he has to get into the valence of something which is offended. Now, that unsnarls very easily. Christ bore the burdens of all Man and the world, didn’t he? So, if a person keeps on offending, offending, offending against the Seventh Dynamic, he will eventually offend so wrongly and so widely and broadly that his only solution to it is to wind up as Christ. Now, the only reason anybody is carrying around an aberration or a somatic, by the way, according to theory, is that he has used some counter-effort he received sometime to destroy along one or more of the dynamics. That’s one for you to note in auditing. The phenomenon of the overt act is very important. You hit Bill, you hit him, and a few days or weeks later, your eye isn’t so good and you can’t find out why. It’s because you hit Bill, you regretted hitting Bill. Now in the case of the woman beaten by her husband, the engram contains just two valences. Who won? Here is the law of “tooth and claw,” the aspect of survival in engrams. Who won? The husband. Therefore it is the husband who will be dramatized. She didn’t win. She got hurt. Aha! When these restimulators are present, the thing to do is to be the winner, the husband, to talk like him, to say what he did, to do what he did. He survived. “Be like him!” say the cells. Hence, when the woman is restimulated into this engram by some action, let us say, on the part of her child, she dramatizes the winning valence. She knocks the child down and kicks him, tells him he is a faker, that he is no good, that he is always changing his mind. What would happen if she dramatized herself? She would have to fall down, knocking over a chair, pass out and believe she was a faker, no good and was always changing her mind and she would have to feel the pain of all blows! “Be yourself” is advice which falls on deaf reactive mind ears. Here is the scheme. Every time the organism gets punished by life, the analytical mind, according to the reactive mind, has erred. The reactive mind then cuts the analytical mind out of circuit in ratio to the amount of restimulation present (danger) and makes the body react as if it were the person who won in the earlier but similar situation where the organism was hurt. Now what happens if “society” or the husband or some exterior force told this woman, who is dramatizing this engram, that she must face reality? That’s impossible. Reality equals being herself, and herself gets hurt. What if some exterior force breaks the dramatization? That is to say, if society objects to the dramatization and refuses to let her kick and yell and shout! The engram is still soldered-in. The reactive mind is forcing her to be the winning valence. Now she can’t be. As punishment, the reactive mind, the closer she slides in to being herself, approximates the conditions of the other valence in the engram. After all, that valence didn’t die. And the pain of the blows turns on and she thinks she is a faker, that she is no good and that she always changes her mind. In other words, she is in the losing valence. Consistent breaking of dramatization will make a person ill just as certainly as there are gloomy days. 1) Understand and abandon the use of Overt-Motivator Sequence in Scientology theory and practice along with suppressive concepts such as “being a victim” that discourage the act of confronting and expanding responsibility over other people and their actions. The terms “overt” and “motivator” should be clarified in their meaning or replaced with less evaluative terms. 2) Restore the use of Creative Mock-Ups in handling facsimiles at will and without the need of an auditor. 3) Reorganize Scientology processing to mimic TR’s and Objectives where CREATE and CONFRONT are equally balanced, that is, one takes responsibility for BOTH the actions created by self and actions created by others (confronting and duplicating causative actions of other beings) while recognizing others as equally cause (as opposed to trying to attribute all cause to self). This is how it is done with real people doing TR’s – each is cause – then why should a different logic be used in auditing? If another person did something, then you need to acknowledge another person as cause and grant them responsibility for their actions. 4) Any address to overts and withholds must end with increased responsibility (ownership) over all the factors involved including the target terminal(s), which is the ultimate goal of processing, not merely “admitting” to something. A PC should not work toward “ability to admit” but toward increasing one’s sphere of responsibility across the dynamics. Also see page: Action and Perception. As was already noted under KEY POINT at the beginning of this page, the most damaging aspect of this new theoretical framework is actually the suppression of thought which begins with subversive definition and evaluation of JUSTIFICATION and CRITICISM as symptoms of having committed overt acts. In this light most criticism is justification of having done an overt. So there are rightnesses and wrongnesses in conduct and society and life at large, but random, carping 1.1 criticism when not borne out in fact is only an effort to reduce the size of the target of the overt so that one can live (he hopes) with the overt. …criticism always tells you where the overt is… It all comes out of an overt. There is practically no such thing as honest criticism. If you’re thinking unkind thoughts about him, you must have done something to him. Now what did you done? 1. The action of showing something to be right or reasonable. 1.1 Good reason for something that exists or has been done. It obviously comes from the word JUST which itself means “right” or “fair,” “appropriate to the circumstances.” From this word we get important words like JUSTICE, JUDGMENT, ADJUDICATION. 1 The expression of disapproval of someone or something on the basis of perceived faults or mistakes. 2 The analysis and judgement of the merits and faults of a literally or artistic work. – again a very important mental faculty directly related to the abilities to REASON and to PERCEIVE. Criticism = Judgment = THOUGHT or REASONING connected to PERCEPTION. Justification and Criticism are both PRODUCTS OF REASONING which are obviously connected to one’s ability to reason as well as one’s ability to perceive. Scientology itself could be viewed as a SYSTEM OF REASONING that includes many different assertions that often come into conflict between each other (such as between the theories and methodologies of the 1950’s and 1960’s). The notion that someone’s EXPLANATIONS and JUSTIFICATIONS surrounding various actions as well as CRITICISM of someone or something are all simply indicators of “overt” acts – “overt” being a concept or designation that is itself dependent on REASONING or ADJUDICATION of some act as being “wrong” – this notion is yet another form of (suggested and enforced) reasoning in Scientology that is used to effectively invalidate the (undesirable or disagreeable) product of individual’s reasoning and inhibit individual’s ability to reason in a self-determined fashion. So in the end, no matter how it is rationalized, Hubbard’s “logic” in this area serves to accomplish suppression of independent thought and disagreement. How is it that Dianetics which was said to be the SCIENCE OF THOUGHT transformed into something that frames the process of reasoning itself into something negative – simply an indicator of there being something wrong with the person? Justification, Criticism, Explanation, and even Thinking itself (“Thinkingness”) have all taken on negative connotations with the 1960’s Scientology. Here are a few quotes to demonstrate the importance THOUGHT was given in pre-1960’s Scientology. Dianetics itself was said to be a science of THOUGHT. Where it does not lead to freer thinkingness and enlightenment in the individual, I consider I have failed. In Dianetics we are dealing then with theta and MEST. Theta is THOUGHT, life force, elan vital, the spirit, the soul, or any other of the numerous definitions it has had for some thousands of years. AXIOM 1—THE SOURCE OF LIFE IS A STATIC OF PECULIAR AND PARTICULAR PROPERTIES. AXIOM 22—THETA AND THOUGHT ARE SIMILAR ORDERS OF STATIC. So what is happening here with our new “groundbreaking technology?” The THOUGHT is bypassed and invalidated and the auditor (more like a handler or an authoritarian interrogator at this point) now digs for the actions directly. 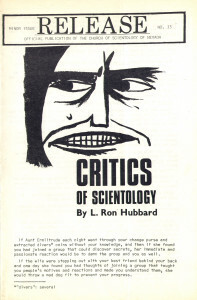 Unable to think freely under Hubbard’s paralyzing, thought-stopping mandates of no creative thought and no criticism, a Scientology practitioner, having lost a grip on his or her thought process, is no longer in good control of one’s actions since one must be free to observe and evaluate in order to be able to decide what to do to in the first place. It is also worth noting that free emotion is also inhibited in Scientology with concepts such as no HE&R (human emotion and reaction) and is manipulated with concepts like up-tone and down-tone. If you start getting upset and frustrated with something, it will be labeled as HE&R and down-tone or “enturbulation.” Obviously that logic usually applies down the chain of command – senior to junior or a staff member to a parishioner. If a superior does it to a junior (i.e. pumps up emotion) – it’s all-right and being a “good executive” in Scientology’s view. To label some action as an “overt” is a form of evaluation. An act that took place is a fact, but whether it is good or bad, right or wrong, is a form of EVALUATION that can change depending on viewpoint(s) and consideration of factors involved. An overt act is not just injuring someone or something; an overt act is an act of omission or commission which does the least good for the least number of dynamics or the most harm to the greatest number of dynamics. Commonly among Scientologists an overt act is simplified to mean a “harmful” act, yet what is and isn’t harmful is again a form of evaluation, and the concept of “harmful” can be stretched to mean almost any form of action that someone disapproves of for one reason or another. – “good quality” would be a form of evaluation. In the same sense, a word “act” would symbolize a form of occurrence that took place in existence while an “overt” is a form of evaluation. So an “overt act” in actual fact is an act that has been evaluated as wrong for one reason or another. Of course, it is never stated in Scientology that “overt” as a designation is a form of evaluation. Instead, an “overt act” has been framed and treated in Scientology as something factual as if it was on the same level as an engram – a concept designating an actual existence in the form of a memory recording that can be contacted and processed using specific methods. AN ACT THAT IS CONSIDERED WRONG BY SELF OR OTHERS WITHIN A GIVEN RELATIONSHIP. Since “overt” as a designation is an evaluation, treating and auditing any act as an “overt” by an auditor (as is done in Scientology) results in an immediate break of the Auditor’s Code (PDF), specifically, EVALUATING FOR THE PRECLEAR and most commonly INVALIDATING PRECLEAR’S DATA if the preclear does not agree with the EVALUATION of some act as being an “overt.” The technical term in Scientology used to invalidate preclear’s own reasoning with respect to a given action is “justification” (explaining how an overt is not an overt). Indoctrinated Scientologists then get stuck with FIXED EVALUATIONS of certain acts as being “overt” – evaluations they then try to force on each other within a group and the rest of society at large. Actions considered “overts” include all the “offenses” listed within Scientology Ethics Codes (to include “suppressive acts”) as well as various actions listed on different Security Check Lists (which can be compiled at will by authorities within Scientology) and can even include such things as communicating with a Scientology critic or reviewing information critical of Scientology or even exploring alternative methods and philosophies. In addition, there are also negative labels and evaluations directed at an individual him or herself for having engaged or continuing to engage in actions that are considered “overts” within Scientology culture. So it is not just an issue of (fixed) evaluations of actions, there is also an issue of (negative) evaluations of persons engaged in the actions. When all is said and done, with all the changes introduced throughout 1960’s, Scientology effectively became what could be understood as a system of enforced reasoning and evaluations for the purpose of manipulating the consciousness of groups and individuals. People leave because of their own overts and withholds. That is the factual fact and the hardbound rule. A man with a clean heart can’t be hurt. The man or woman who must must must become a victim and depart is departing because of his or her own overts and withholds. It doesn’t matter whether the person is departing from a town or a job or a session. The cause is the same. A recent Secretarial Executive Director to all Central Organizations states that before a person may draw his last pay cheque from an Organization he is leaving of his own volition he must write down all his overts and withholds against the Organization and its related personnel and have these checked out by the HCO Secretary on an E-Meter. To do less than this is cruelty itself. The person is blowing himself off with his own overts and withholds. If these are not removed then anything the Organization or its people does to him goes in like a javelin and leaves him with a dark area in his life and a rotten taste in his mouth. Further he goes around spouting lies about the Organization and its related personnel and every lie he utters makes him just that much sicker. By permitting a blow-off without clearing it we are degrading people, for I assure you, and with some sorrow, people have not often recovered from overts against Scientology, its Organizations and related persons. They don’t recover because they know in their hearts even while they lie that they are wronging people who have done and are doing enormous amounts of good in the world and who definitely do not deserve libel and slander. Literally, it kills them and if you don’t believe it I can show you the long death list. You can’t complain, you can’t criticize, and you can’t leave without someone in the organization trying to force you into “confessing your sins” or labeling you as some kind of a “criminal” hiding misdeeds. And so if you can’t complain, if you can’t criticize, and if you can’t leave – obviously given that you get hooked on Hubbard’s new tech – all you’re left to do is to follow and to virtually agree with anything that comes down to you from Hubbard and his emerging authoritarian command. This is a detailed explanation of the TECHNICAL CHANGE that allowed for the creation of an ultra authoritarian group construct in Scientology. However, making compliant followers instead of powerful and independent individuals came at a cost, an unintended “side-effect” you might say: if an individual was now in a condition to be better effected by Hubbard and his authoritarian structure, that individual was now also subject to greater effect by persons and forces outside of Scientology as well – the “external influences” as it is called in Scientology. This is where we come to our next section covering another piece of “technology” that followed – the PTS/SP Technology. HCO BULLETIN OF 8 SEPTEMBER 1964 OVERTS, WHAT LIES BEHIND THEM? “Sec Checking,” “Integrity Processing” and “Confessionals” are all the exact same procedure and any materials on these subjects is interchangeable under these titles.